← From a Mommas Heart! While doing some PR for Carol Hogner I started listening to and following HLE Radio. I heard a song called Jesus Was A Rebel. I fell in love with that song. Sometimes we can get so caught up in stuffy old religion and forget that Jesus didn’t go with the flow. Jesus hung out with the Rebels and outcast. He took His Light to them. I friend requested Steve Roberson in October 2013. I realized then he has such a sweet heart and wants people to see the fun loving side of Jesus. Throug out this last year I have watched his Social Media post and peoples interaction with him. This Novemebr I traveled with Carol Hogner to the ICM Awards in Nashville and was blessed to meet Steve in person. Steve is just as personable and fun in person as he is on Social Media. I asked him if he would participate in my interview for my blogs. I’m so glad he said yes. I hope you enjoy getting to know a little more about Mr. Steve Roberson. Be sure to check out the links I’ve inserted into this blog to listen to his music and follow him on social media. 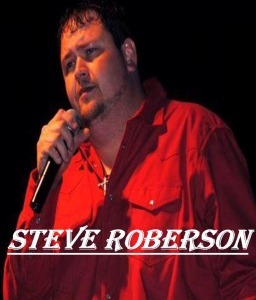 Steve is on the road full time performing at venues such as fairs, festivals, rodeo’s, and churches all across the country, and is also a staff songwriter at Oden’s Row Publishing in Nashville, Tennessee. He has had numerous cuts in Southern Gospel, Christian Country and Mainstream Country Music. 2014 has proved to be a successful year for Steve, as he has been blessed with three number one songs on several Independent Country and Christian Country Charts, including the ever popular “Jesus Was A Rebel” and current chart topper “Letting Angels Down Easy”. Q.How long have you been singing Country and Inspirational Country Music? Steve: I’ve been singing Country Music all of my life it seems! After I got saved and in church in 2005, I thought that the country side of music was over for me. I knew very little about Gospel Music, but I was asked to audition for the lead singer position in a Southern Gospel Quartet based out of Clanton, Alabama. I sang with “The Samaritans” for about four years. Then for almost another year with “Broken Vessels”. Then in the summer of 2006, we were booked to sing at an outdoor festival near Montgomery, Alabama. And that is where I was introduced to Christian Country Music! Tommy Brandt and Danny Ray Harris were the headliners for this event and I was in heaven! I’m sure that I asked those two guys a thousand questions that day! I ended up with both of their CD’s and Danny even gave me some of his tracks to sing with. In 2012, Danny would also introduce me to playing in Cowboy Churches around the country while we toured together for a year as “The Southern Boys”. I’m forever grateful to Danny, Tommy and everyone else who has had a hand helping me on my musical journey! Q. What artist would you say has influenced your music the most? Steve: WOW! That’s a loaded question!! Where do I start? There are so many that I could truthfully say, but I’ll narrow it down to a few. I always loved the smooth, powerful voice of Travis Tritt. He’s still one of my heroes in music. The great Marty Raybon is another! I still get chills hearing him and Shenandoah sing “The Moon Over Georgia”!. The other is Scott Roberts of Broken Vessels. There are so many artists on stage nowadays that in my opinion, are trying to put on a show for the sake of entertaining someone. Scott doesn’t have to do that because he is real. He truly wants God to use him to make a difference in the life’s of others, and it shows through on stage. And I’m thankful for the difference that he has made in my life! Q. What was your first song to hit the air waves? And which station started your adventure on air? Steve:The first one would be with The Samaritans. We did a song called “Joy In The Morning” that got some local airplay at Gospel Station WKLF in Clanton, Alabama. The first one for me as a soloist was a song that I wrote with my brother Frankie called “Pretty, Pretty Angels”, also at WKLF. Q. What would you say was the defining moment in your music ministry that you knew that this was what you wanted to do? Steve: Defining moment?…. I don’t think that I can recall one. I’ve just always known that this was it for me! Q. What motivates you to keep going when your tired? Steve: There are people out there in the world that are hurting, and I believe that God can use me, and the music that He gives me to reach them, ease their pain and lead them to Him. Q. Do you have any new projects in the making? Steve: Yep, a new CD packed with Crank Down Christian Country, and Positive Country is due out in late January with a new radio release to go along with it! Q. What’s your current single on the air waves that we might hear? Steve: “Letting Angels Down Easy” written by Randy Finchum and Chuck Oden is still going strong at Independent Country Radio and almost a year after it’s radio release, “Jesus Was A Rebel” (Finchum-Gibson) is still one of the most requested song at a lot of stations! And let’s not forget about “God Gave His Gift To Me” (Finchum-Batts-Roberson) My Christmas single. Q. Can you share one of your funniest memories of Singing on stage or while recording? Steve:WOW again! I have a lot to choose from! It has to be the time when I was singing at an old country church somewhere in Georgia. The church was in serious need of major repair and stage floor was very unstable to say the least! And to make things worse, I was weighing in at around the 400 lb mark! The service was almost over when the floor busted open and I fell through it into the baptismal tank, a tank that the church had no idea was there! Here’s the funny part. The Pastor said that they had been praying that The Lord would provide them with a way to baptize their church folks! I guess that The Lord does indeed work in mysterious ways! Thank you Steve Robberson for this great interview!!! To contact Steve for your next event…. This entry was posted in Blog, Dreams, Faith, Family, Goals, God, informational, inspirational, music, Rodeo, Southern Gospel and tagged Christian Country Music, Christian Music, country music, Faith, Inspirational Country Music, Music. Bookmark the permalink.